Well, it’s finally here. 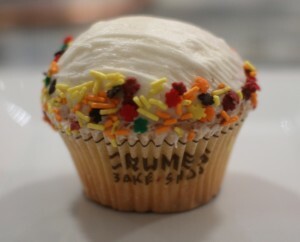 After much hype over the last few months, New York’s famous Crumbs cupcake shop has landed in DC. The first location in the DMV opened near Metro Center at 11th and F Street, and two more locations are expected soon in Clarendon and Union Station. My friends and I happened to be in the area last night for a pre-Thanksgiving happy hour at Vapiano, and decided to check out Crumbs to see if it lived up to the hype. I have tried a small cupcake from one of their New York shops in the past, and my friends have always raved about them, so we couldn’t resist and headed over there. There were way too many to choose from, from simple flavors like Pumpkin and the Vanilla Gobble Gobble (Vanilla Cake with vanilla frosting) to more creative confections such as Cookie Dough and the “Squiggle”, a Hostess cupcake lookalike. 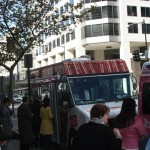 Some selections appeared extremely decadent, such as Peanut Butter Cup, Tiramisu, and Blackbottom Cheesecake. They also had massive “cupcakes”, dubbed The Colossal Crumb, which were literally the size of a whole cake, as well as seasonal collections for Thanksgiving, Hanukah, and Christmas. The shop had an extensive drink list on their wall of hot and cold beverages, and last night they had a special where you could get a free small coffee with the purchase of a cupcake. My friend purchased a four pack which we were all drooling over, while the three of us decided to split a Cookie Dough cupcake. I even brought home a Vanilla Gobble Gobble for Brett and me to share. 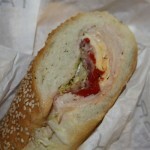 The cookie dough flavor was mainly in the icing, accompanied with vanilla cake and some chocolate filling. It was decent but didn’t necessarily blow me away. I was hesitant to bring home such a simple flavor considering the options offered, but as it turns out, simplicity goes a long way. When we cut into the huge cupcake, the vanilla cake was incredibly moist and went perfectly with the vanilla frosting and festive fall-colored sprinkles. 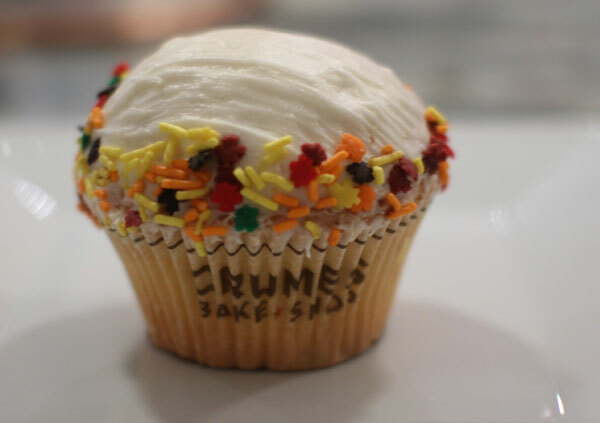 If I had to compare Crumbs to any local cupcake spot, I’d say their cupcakes most resembled those found at Baked and Wired, due to the sheer size and variety of flavors. These made Georgetown Cupcake’s product seem tiny by comparison, and were much more cake-like in consistency. Given the downtown location, we would most likely visit if we happen to be in the neighborhood, so it looks like we’ll be in the area a lot more in the coming weeks, err, days? 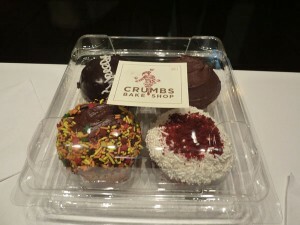 I’m so glad to see Crumbs in the area, I just wish that they would move into Bethesda to give GTCC a run for their money. Now, if Magnolia would come down here, that would be the tastiest of the tasty! Happy Turkey Day to all!